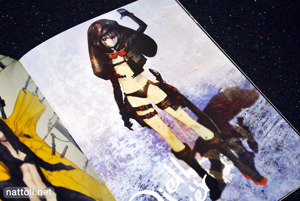 DW is 36-pages including the covers, B5-sized and staple-bound. 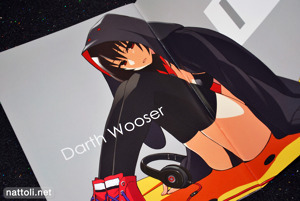 As the presenter for this collection, CHANxCO illustrates the cover Darth Wooser along with four more on the inside. 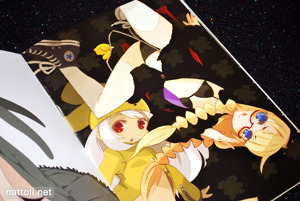 Darth Wooser is sometimes depicted with glasses, and other times not, but CHANxCO includes an alternative glasses version of the cover art in the back of the book. 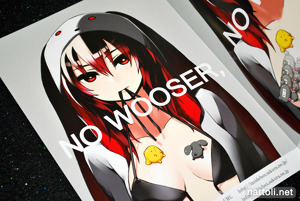 Pictured above right is Mota's rendition of both Darth Wooser and Wooser. The artist list for this collection is really quite impressive. We start out with a rendition from DOGS artist Miwa Shirow, that has a very graphic novel style to it. 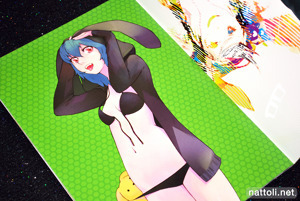 Guitar's rendition is pictured top right, with a small Wooser pulling Darth's bikini. 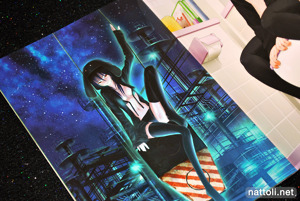 On the bottom left is an illustration by Yonasawa, and the bottom right features art work by Puchi Eva character designer Hamamoto Ryuusuke. Some of the other artists at the front that aren't pictured were Tsukigami Lunar, Nagian (凪庵), Matayoshi, and Shigatake. 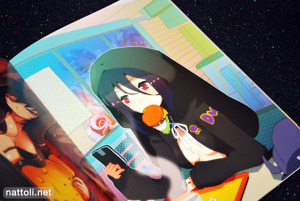 The characteristic black hoodie was present in (I think) all of the illustrations, but other things like Darth Wooser's glasses and the color of her stockings changed from time to time. And for the most part, it would appear she has difficulty tying strings. 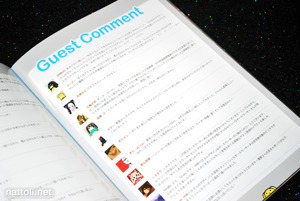 Pictured above from left to right are illustrations by YahaKo, Kozaki Yusuke, TNSK, Atsuya Uki, Tomatika, and Putidevil. I was really surprised to see an illustration from Kozaki Yusuke, but I wasn't too impressed with his rendition of Darth Wooser, especially compared to a lot of the other designs. Mebae is also in this, but the illustration was a little too bloody (and weird) to include. More from the impressive line-up of artists; going clockwise we have redjuice (whose illustration also appeared in his C78 release IGNITION), Huke, NishiEda and Saitom. 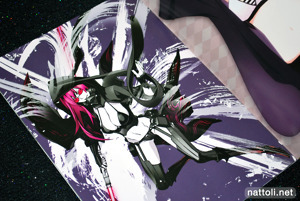 Huke really went all out on Darth Wooser's costume design, and Saitom also went for the armored warrior look as well. DW was part of two Wooser releases for C78, the other one being Mirror Twins which featured many---but not all---of the same artists. Though I bought my copy early on through Toranoana, it's currently sold out, so auction sites and used book shops are the best bet.